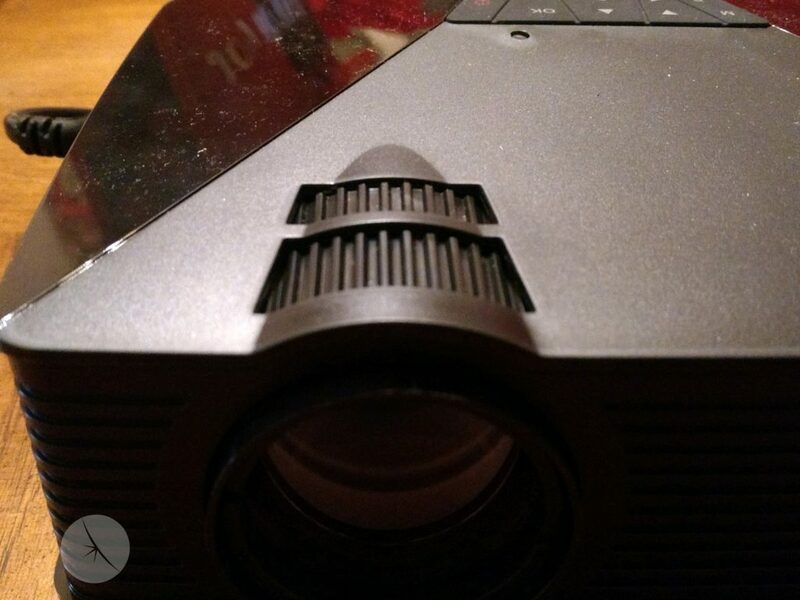 Made by DBPower, the GP15 Mini is a portable projector. The unit is fairly light and strikes me as compact. On the one hand, it has a bevy of input options, and yet on the other hand it seems to struggle in other areas. The unit that I was sent is all back and plastic. it came with a black power cable that I’d approximate at 4 feet in length. 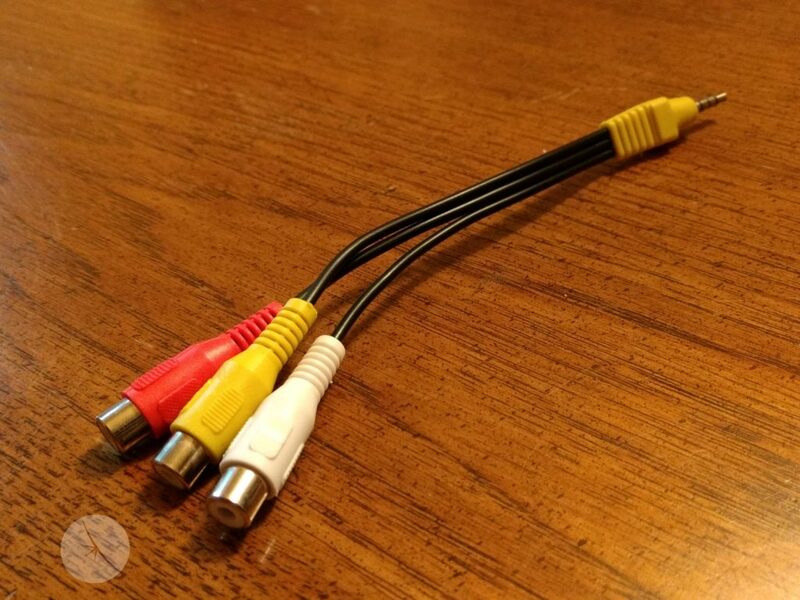 Other accessories included are a remote control, as well as a convertor for the red/yellow/white A/V connectors that were commonly found on older gaming consoles, VCRs, and tube TVs. The unit is 8.2 x 6.7 inches horizontally, and 3 inches tall. It didn’t strike ma as very heavy at all, and should easily be able to slip into a suitcase, duffle or shoulder bag, backpack, and the like. The cables and remote are smaller yet, so portability shouldn’t be an issue for the prospective user. It booted up in seconds, and has a built in speaker as well as a 3.5mm headphone jack for audio options. The speaker was amply loud, when in the same room as the projector. The sound was a bit on the tinny side though, so don’t expect to mistake it for the latest in sound technology. I also plugged in a pair of earbuds into the audio jack. Sound switched from th loudspeaker to the buds, and while the quality of the sound improved a bit, it was still lacked a bit of the low end of sound one might expect. 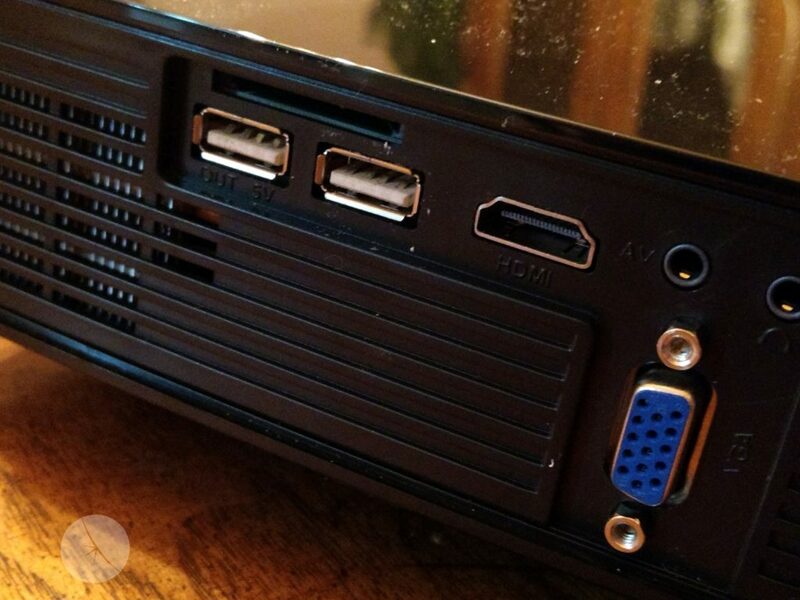 I tested this audio with a Wii (for the A/V connectors it uses), a PS3 (which oddly enough NEVER sent audio through the unit’s speakers or headphone jack), and my 1st gen NVidia Shield TV, which again, sounded tinny but worked fine. When using the A/V, I did notice a bit of a buzz coming though the earbuds, that doesn’t come through on the TV, so keep that in mind. As for the visual side of this, it was servicible. 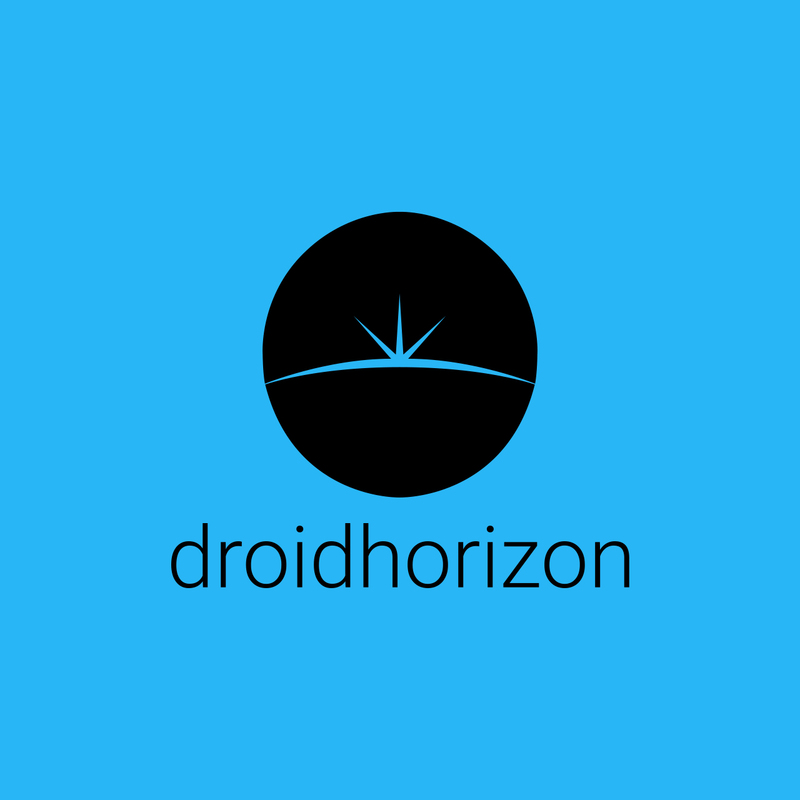 When I first booted it up, there was a splash screen of the company’s name in white, against a blue backgound. 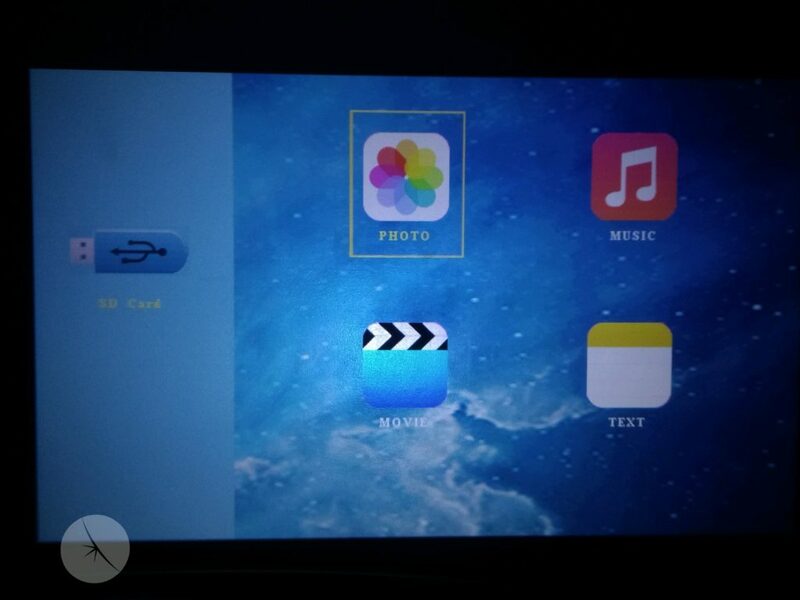 From there, it has a “home screen” containing four icons on the right, and the chosen input method indicated on the left. 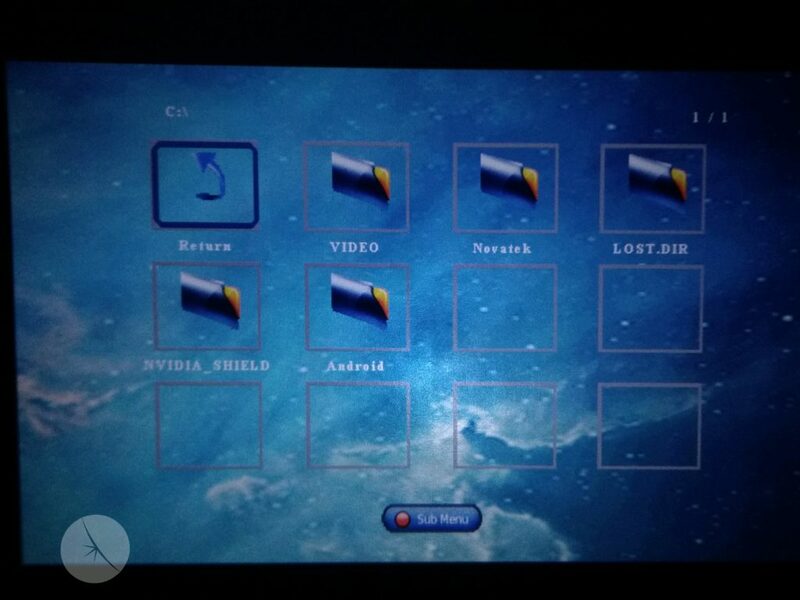 Some of the formats require the users to search for the files, such as USB or via SD card (full size)(. I shot some pics and videos on a digital camera, then transferred the microSD card into a USB converter, and over to the projector. In using that format, I had to search for the pictures and files, using the remote to guide a cursor on the screen, projected onto the wall. If I wanted to look for pics, I had to select that option and then dig through a file manager in order to view them. if they all happened to be in the same folder, I could select them with little checkmarks, and then hit OK and watch the pics cycle through one another until I stopped the process; I can’t imagine getting that to work if the pictures were in disparate folders. The same process applies if I were to search for video, music, or text, by selecting one of the remaining three icons and digging though a vile manager to find them. One might expect that perhaps it could search for the formats it recognizes and somehow “float” them to the top, to save users from digging around? I have a hard time picturing someone that struggles with technology being able to successfully navigate through this system. Other formats were easier though, namely the A/V and HDMI formats; these appeared right on the screen once they were plugged in (with sources turned on), and the appropriate format was selected for the projector. Still shots such as paused video or pictures looked pretty sharp, but didn’t QUITE measure up to my 1080p TV; things were bit closer though between my older Tube TV at 480i, and the same image projected though the unit. 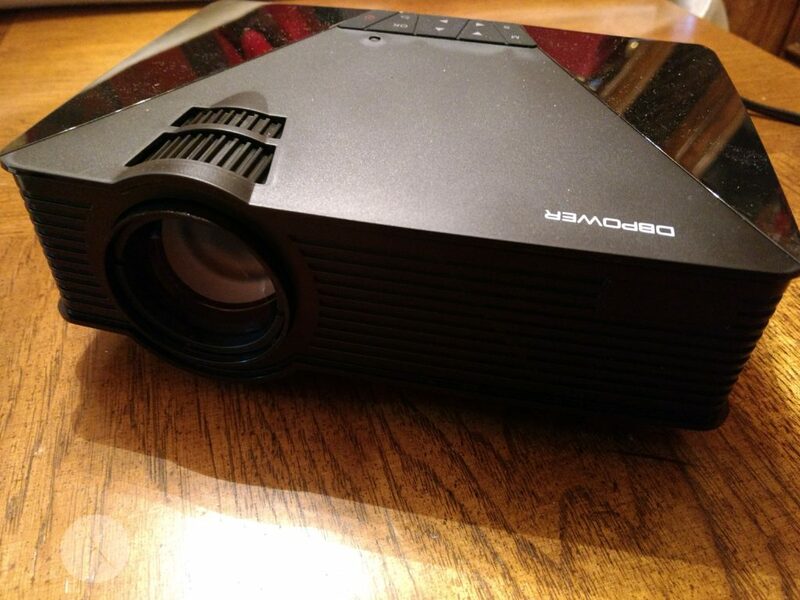 Movies at 1080 looked good, but not as good as on my TV. The resolution wasn’t quite as sharp, nor was the movement quite as smooth. Oddly enough, dropping down to 720p on my PS3, the video was nearly as smooth as what I’d expect on my TV, and the Wii at 480 was also just as smooth, but seemed to have a bit of lag from the controller. Lastly, the unit has a fan that was audible, but far from obnoxiously so. 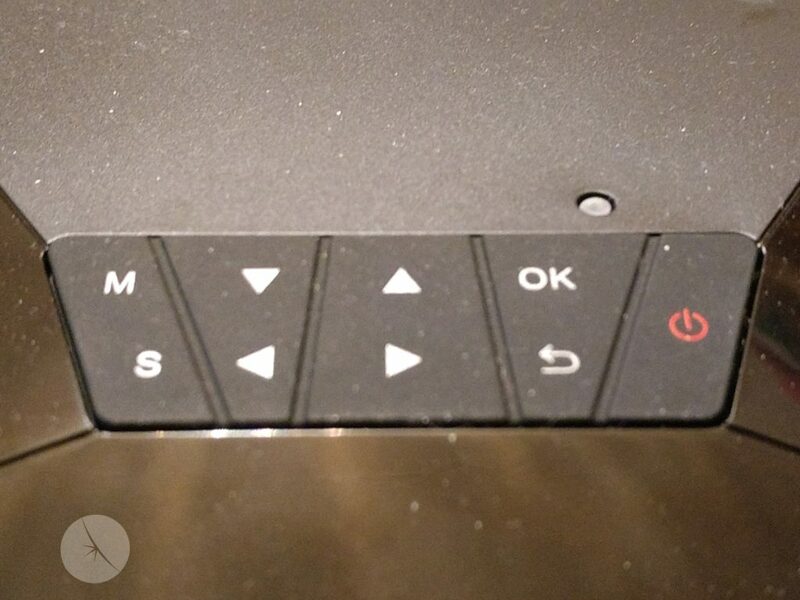 Also, it contains several buttons on the top of the projector, that mirror what’s on the remote: four navigation buttons, Menu, Source, Power, OK, and a Back button. Contrasted with that is the remove, which has staple buttons such a volume, and more. Frankly, the unit can’t be used to its fullest extent without the remote. 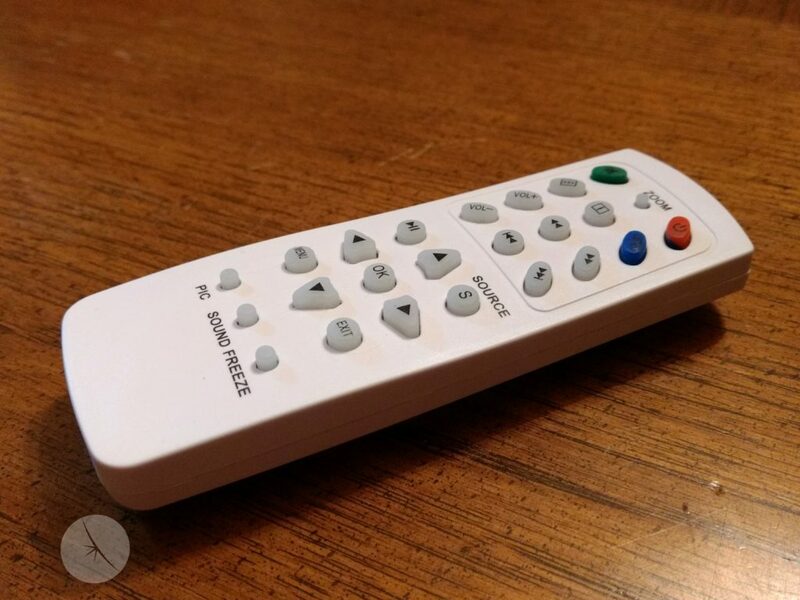 Oddly enough, this remote can be pointed in any direction, but needs to be (more or less) visible to the “eye” in the back, so users can rule out setting up a projector in the back of the room, while controlling it from the front. Lastly, I found it’s success at reading file formats to be hit or miss. First, I’m at a loss as to why the user manual doesn’t list the supported formats,and I had to email the company to get a list. Second, while my .mp4 videos were located, I was informed that they were “unsupported”. On the other hand,.3gp was a supported format. At the end of the day, this unit is a real head-scratcher. It’s inconsistent in so many ways. Some input methods start right up, while others need to be sought out by the user. Some of the purported file formats are supported, while others apparently are not. 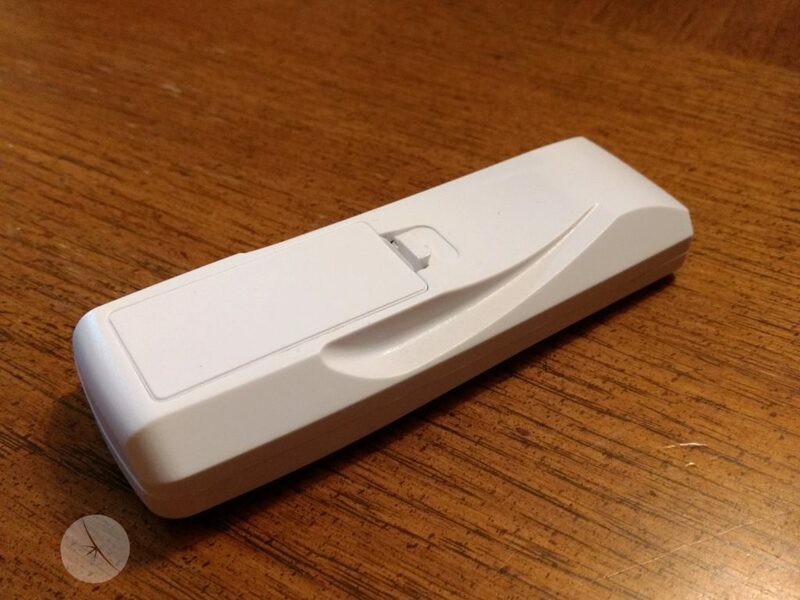 The remote works when it’s in the right spot, relative to the sensor, located directly on the back of the unit, but from any other direction… it won’t. I guess this could be boiled down to this: it can be used, but on its terms and not the users. I can’t see how useful this is when one video format has buzz when using earbuds, another didn’t seem to carry any sound through at all, finding a using some formats will take more work than you will want to put into it, and the remote only works from behind. 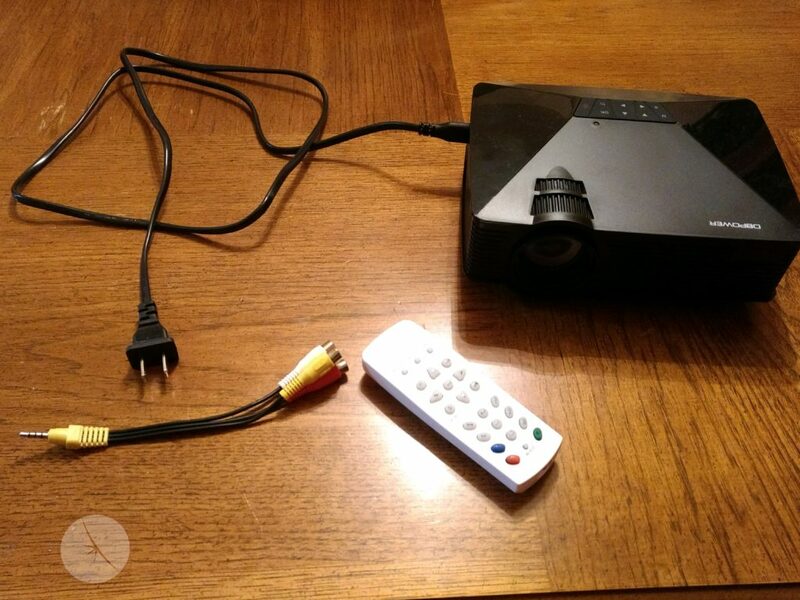 If you are willing to jump through those hoops, this could be the projector for you. But I’m hard pressed to give this even a qualified recommendation, with all those caveats I just listed out. Therefore, I’m scoring this a four. It does function at the most core level by putting images up on a wall or screen, while there are too many peripheral issues to overlook. I check lot’s off site but here i got what i looked for . It’s a nice post and have lovely quality of content . Thanks for sharing such amazing content. Keep it up.